It was a musician's worst nightmare. At least that's how Dave Schneider, guitarist and singer for Hanukkah-themed rock band The LeeVees, described it when his guitar—a 1965 Gibson ES-335—got jammed in an elevator by baggage handlers at a Detroit airport. Schneider was traveling with fellow LeeVees guitarist Adam Gardner from Portland, Maine, to St. Petersburg, Fla., for a gig last month at a conservative temple when their flight was diverted to Rochester, N.Y., due to bad weather, causing them to miss their connection in Philadelphia, Pa. They then drove to Buffalo, N.Y., to hop on a plane destined for Detroit, Mich., where they planned to make a connecting flight to Tampa, Fla. While boarding in Buffalo, Schneider says he asked Delta staffers not to check in the vintage guitar—which he estimates is worth about $10,000—and allow him to carry it on the plane and place it in an available space, as he did on the flight from Portland. "I've always carried it on," Schneider, who also tours as the lead singer of the hockey-themed rock group the Zambonis, told Yahoo News. "Never been a problem before." Schneider says he even showed them a link to a story about Congress passing the FAA Modernization and Reform Act of 2012 that made it easier for musicians to fly with their instruments—allowing them to purchase an extra seat on the plane for their fragile instruments. When their plane landed in Detroit, Schneider says, "I had a bad feeling." He whipped out his iPhone and started filming. As the pair of rockers waited at the gate for their checked guitars, Schneider asked a member of the flight crew to check on his prized ax as it was being removed from the plane. "He did and said it would be fine," Schneider recalled. But as the musicians waited for the luggage to appear, they could hear a screeching noise coming from the elevator. "It was this crazy sound," Schneider said. "Metal on metal." 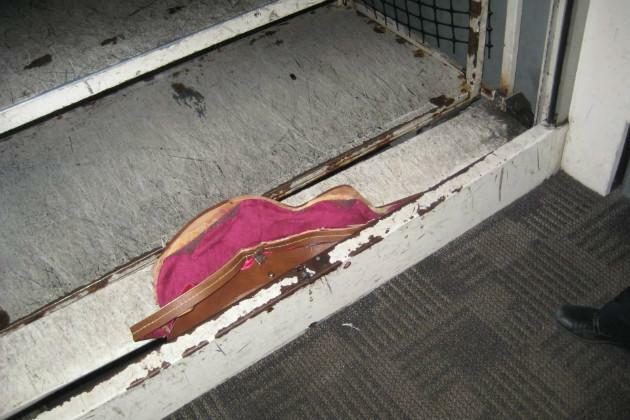 The case carrying Schneider's semihollow-body guitar was lodged between the mobile service elevator and a rail on the loading dock, shaking the elevator door. The case even bent a steel beam. The guitar itself was pinned between two beams and took workers an hour to retrieve it. It sustained damage to the bridge, neck and tail that would cost an estimated $1,980. But so far, Schneider says, Delta has given him the "runaround." He says the airline offered to cut him a check for $1,000 in Tampa, but Schneider refused it because he didn't know how much the repairs would cost. The online claim forms he filled out after the guitar carnage were blank when Schneider checked on them, and two emails he sent to Delta chief executive Richard Anderson were not returned. Delta told Yahoo News that the airline "will be reaching out to the customer directly to discuss how we can make this right." "This instance is certainly not indicative of the high regard we hold for our customers’ property when they travel with us, and for that, we apologize," Delta spokesman Morgan Durrant said in an emailed statement. "We look forward to making a direct and sincere apology to the customer as we work with him to rectify what happened." This is not the first time touring musicians have clashed with baggage handlers. In 2009, Dave Carroll, a Canadian singer-songwriter, turned his experience with United Airlines into a music video ("United Breaks Guitars") that went viral and landed him a book deal. Schneider, though, says he isn't looking for that kind of fame. "I'm not a greedy dude," he said. "I'm just looking for $1,980."